Sam Hoyt passed away on Monday, April 3 after his battle with cancer. 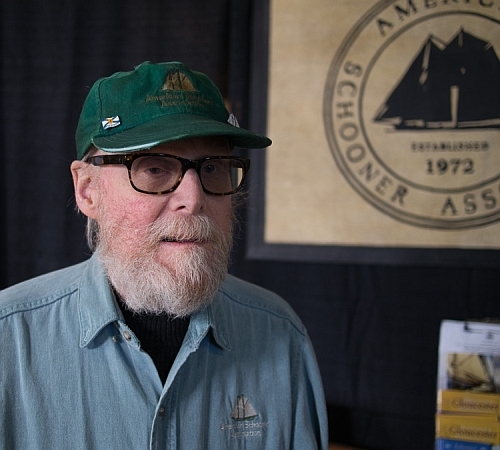 Sam was a past Commodore of The American Schooner Association and a two time recipient of the American Schooner Association Award, including the award in 2017 acknowledging his many years of service to the association. Sam's involvement with Schooners started with the Seven Seas Sailing Club under Capt. Ted Charles, sailing on the Alden Schooner Volante and the 72' staysail schooner Golden Eagle. During this time he competed in the first schooner races including the Mayors Cup in NYC and the Mystic schooner race, kicking off a passion that lasted up to the Great Chesapeake Schooner Race of 2014 on Mystic Whaler. Sam and his wife Jeanette spent many years sailing the Northeast coast on their Crocker schooner Wild Swan. About ten years ago Sam fulfilled a life long dream, making a trans-Atlantic crossing with the Philips on Voyager. Sam greatly enjoyed the company of the schooner community, from the musical evenings at the annual meeting, the various rendezvous and races, to the Dog Watch column he contributed to Wing & Wing for many years. Sam is survived by his wife Jeanette, daughters Megan and Samantha and son-in-law Brian, his brother and sister-in-law Jack and Penny, three grand children and numerous nieces and nephews.